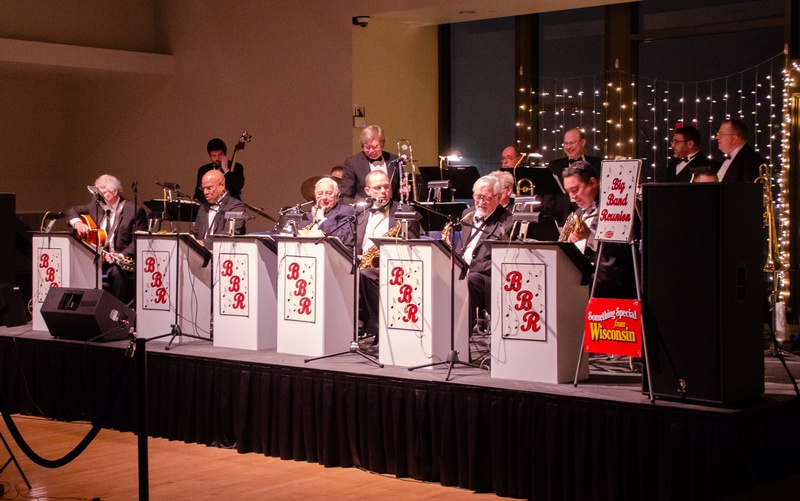 The music for the Ball is the same from year-to-year, a brass band that specializes in swing and Big Band music. To conclude the Winter Carnival celebration, the annual President’s Ball was held on Saturday, Feb. 2. The dance was held in the Somerset Room of Warch Campus Center. The formal event began at 9 p.m. and finished at midnight. The Somerset Room was adorned with many sets of lights and different decorations, transforming the large space into a ballroom. The Pusey Room was used as a coat room to accommodate the winter gear and add to the formal event. Students, as well as President Mark Burstein, flooded the Somerset Room to dance to the live music provided by Big Band Reunion. Not only was the music a draw for people, but the chocolate fondue also attracted many people—more to the hors d’oeuvres table than to the dance floor. Students also had the opportunity to pose with props with their friends in the photo booth. People could be seen snapping pictures throughout the third level of Warch, as they were eager to capture the winter fun in their classy outfits. Although the formal attire contributed to the atmosphere of the event, it proved nearly dangerous for some people in their trek to Warch. With the recent frigid and damp weather, the cement and bricks outside of Warch were exceptionally slippery. Many students could be seen slipping and sliding on the ice, despite Campus Safety’s best efforts to salt the paths. As one officer explained to students, salt had already been applied twice before the event even started, but the ice froze over nonetheless. Campus Safety could be seen ushering students home, trying to minimize the number of students who would fall victim to the ice. In addition to the many students who enjoyed the ball, the dance was also attended by President Mark Burstein and his husband. The Winter Carnival and President’s Ball annual traditions are provided to students with the hope of bringing some joy into the often long and dreary Winter Term. Falling at the end of Fifth Week, the celebration certainly seemed to lighten spirits—especially after the dangerous weather earlier in the week.